Commercial transportation is one of the most profitable business in not just in Nigeria but in the world at large because people travel everyday. For the fact that you hardly travel doesn’t mean the same for everybody. Transport companies are making fortune from this business because it does not have season. Goods and services move from place to place everyday but there are different means of transportation but the one I will be focusing is land transportation which is the most common transportation. There are four different categories in land transportation system. All of this commercial transportation system are lucrative but their capital are different. In Most states in Nigeria, the use of commercial motorcycle has been prohibited, however some states in the country still allows it in some areas within the city. Commercial tricycles seems to be one of the major ways of transportation in towns and cities. However it has its own limitations. Haulage Services is more capital intense but very lucrative. This is strictly for transporting goods and services. Commercial Vehicles – This is also capital intense and also very lucrative. This can serve as transporting of goods and services and also a transport system for man. There lots of things you must consider before going into this line of business. One of the first things to do is to conduct a good feasibility study report. Its very important. Get to know the dos and donts, the risks involved in the business. Ask questions, transport workers, drivers, union workers so you can know all there is to know before venturing into he business. To start a commercial vehicle transportation business getting a first grade tokunbo vehicle is most advisable. The cost of tokunbo car range from N800,000 to N1.7m depending from where you making the purchase, as for the buses an air conditioner tokunbo bus ranges from 1.9million to N2.5 million. One important thing you should note is that intra-city transport is not as lucrative as inter- state transport. The reason why getting a first grade tokunbo car is mostly advisable is because it saves you the stress and wahala associated with second or third hand fairly used car. Before you start your commercial transportation company ensure your vehicles are registered. There are two important registration that you must do, first is with the Federal Road Safety, and other important agencies to ensure your papers are complete. The second registration is with the National Union Road Transport Workers, NURTW. Very important. Location – Location is another important part of this business it can also be referred to as park. The location of your park makes it easy for customers to locate. If your park is not in a good location this will make it very difficult for customers to locate you. Passengers go to parks that is not difficult to locate because they last thing they want is stress. Employ Qualified Drivers – This is very important. Getting experienced and qualified driver is mostly preferable. Insure the Vehicles – This is also a very important part of this business if you can afford it. This will protect your vehicles from unfortunate lose. To succeed in this business a good business plan will help you. 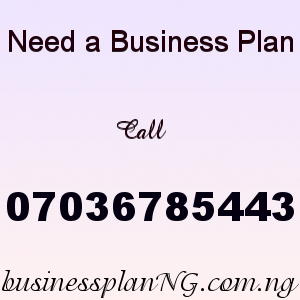 Business plans are like roadmap for business. Our sample Commercial Transportation Business Plan in Nigeria can be used to access bank loans, proposal writing and grant applications. The business plan was complied after a thorough feasibility study on Commercial Transportation Business in Nigeria was done. After you have made payment for your Commercial Transportation Business Plan in Nigeria & Feasibility Study, send your email and payment details to 07036785443. Once your payment has been verified the Commercial Transportation Business Plan in Nigeria and feasibility study will be sent to your email.